This entry was posted on Saturday, January 19th, 2019 at 10:12 am and is filed under Uncategorized. You can follow any responses to this entry through the RSS 2.0 feed. You can leave a response, or trackback from your own site. 59 Responses to Chelsea Preview. Let’s stuff Wagner’s mob and lift the whole mood of the Club. Another spuds at home performance would be just the ticket. Morning Raddy, another fine PM, thank you. I think he has a serious problem with his “tools” as it’s quite obvious that we have a few loose screws. Wagner is a very busy manager – he sure gets around!! Many thanks BR for an uplifting post. May the “tools” be slightly sharper than normal. May Hector remember that when he gets behind a defence he often assists. May our centre backs be Kos and Sokratis. May Terrier return to central MF. May Aubang and Laca both score from an Ozil masterstroke, and may we win 2-1. Is it hot there VP? Thanks for the read BR, great stuff as ever. 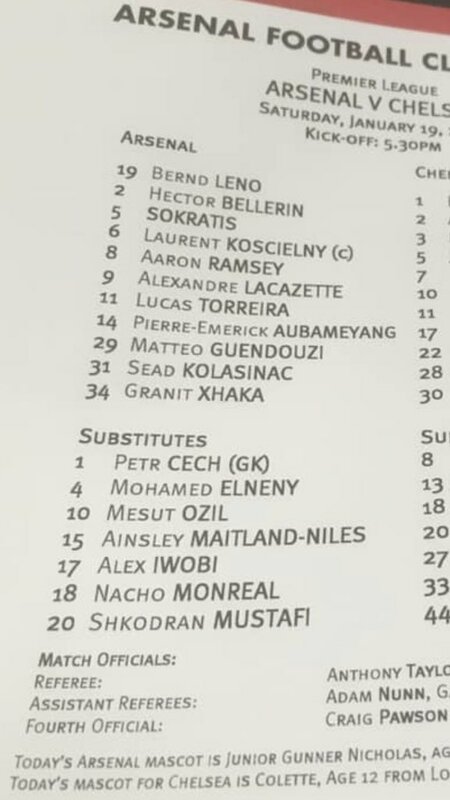 Emery has shown what he wants from his players, its up to Ozil now. I can’t see any problem with Ozil exercising his brilliance in the attacking third as well as making an effort to be stronger in the tackle and playing his part defensively …. not doing so would be a conscious decision by him, not anything beyond him physically. Rightly or wrongly, it appears to be what the manager wants … so come on Mesut … make it look like you’re trying harder when we’re not in possession .. then everyone is happy. I find myself looking on the Arsenal games in a somewhat bemused manner. It is difficult to understand what is happening at Arsenal at the ‘top end’. Player contract management buggered up; money unavailable for the necessary quality purchases; and the promised use of the best youth team players noticeable by their absence. So if we do well I am naturally delighted, but if we struggle I really cannot fault the players, as they always try, but some of them, thru no fault of their own, are just not top 4 quality and there is little to show that will attend to that [see above] with Mislintat, of all people, rumoured to be off soon, when we could do with his scouting prowess. Kroenke et fils are just not footballing people, and with Gazidis also abandoning ship we look like a chicken without its head. I agree with you RA, it has the look of a ship without a rudder, just drifting. Only Xhaka with 21 is ahead of Curly. and IMO he is simply not good enough … yet. Seems to me that Curly is getting the starts due to the lack of alternatives. Who on the bench can play that far back? No one really. Xhaka and Torreira are not enough? What formation we playing today? A 50m striker should bury that chance PEA. That’s the finish of a €50m striker!! Well … we don’t look like a team lacking direction now …. this is the best hard-working display I’ve seen in years. But a long way to go … we need to keep it up right to the last whistle. Brilliant work so far though. Kozzer playing like his old self …. Emery got it right so far, and Ramsey marking his guy into an unplayable box. Would have been nice to see that Auba shot go in. Oh my, memories of a Henry type goal that would have been. Also like the way Leno is punching that ball to the stars, if head gets in there, it’s coming off, rock em sock em style. I have to admit that we are fortunate to be two u but at last we performed in a first half. The Spurs spirit is back. We need at least one more because our defence is sure to concede. I thought we could have been 3 up! …. the chavs have a problem, we’re looking very effective on the break and getting the ball forward quickly and I have to say Ramsey has been incredible, shame the negotiations went wrong. we will miss his energy. 45 precious minutes left Micky to get our season back on track …..
Good to hear the crowd are playing their part …. Bellerin looks in deep trouble. Knee knack. That’s horrible to look at — and ironically it has been the best game for Belli this season. Hope just a pull for Bell, but if he did his patella or acl, then darn! 2 backs done for year with injuries- no luck with this for the Arsenal. Youth team call up or AMN or?? If it wasn’t for bad luck, we’d have no effing luck at all! Totally agree with you by the way, Rasper, Kozzer looks like the CB of old. He has been immense — hope he does not run out of steam. Tor (pitbull) welcome to the EPL..
alonsobozo a dirty player, needs one to the sack! The first no-look header I’ve seen I think! What a goal by Lacazette btw. His touches before the strike were world class. Everyone likes FGG comments, so I’ve removed the bigger one for tomorrow. Great result by a team that showed some real passion and desire to win. All reports indicate that our problems are in the back room, it seems that the split responsibilities are causing serious issues. That may prove to be a tougher fix than team issues. If they don’t get their act together we could be in serious long term trouble. I think I only wrote two sentences, waiting for the second half to start. Four good chances in first half apart from goals. A team pressing game of x3 energy compared to West Ham. Laca and Aubang doing their bit to add to energy of Terrier, Ouzi and Aaron. No Mustafi. Kos approaching his old self. Hector and Wardrobe effective. Crowd backing exciting. I can’t work out if Chelsea were bog standard or we made them look bog standard but either way, bog standard they were. I like the new policy of winning the game in the first half, I could definitely get used to that. The only shadow, of course, is that just when we started to look like we had a proper solid defence — Bellerin — who was so influential, gets crocked. Chelsea wouldn’t be 4th if they were bog standard, but they are predictable. Jorginho and Hazard are vital to them and by stopping Jorginho you stop the supply into Hazard. Emery put a plan into place and it worked perfectly. The frustrating thing is I fancy us against any team in the league at home, but we just don’t seem to be able to produce away. We will struggle to challenge for honours if we don’t figure that out. I was referring to today, didn’t think that needed explaining but hey ho. It didn’t LB!. We neutralized everything of note until they doubled up on A M-N and Terrier tired supporting him. 1 shot on target from them and if Fabinho is more effective than Fabregas ( or Kante for that matter) Mustafi is a quality defender!